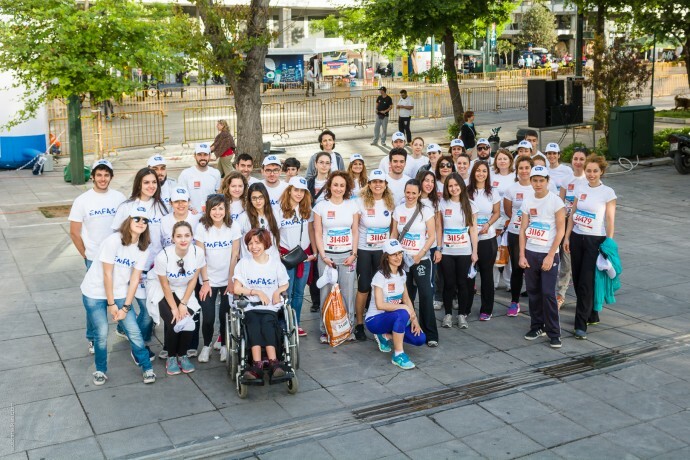 Emfasis Foundation, as an official cooperating non profit organisation participated with 100 runners (friends and supporters) in the Athens Half Marathon, on Sunday 3 May 2015 with the slogan “I run for the homeless of Athens”! Please follow this link to see all of the photos. All the proceeds from the runners’ participation in the 3km , 5km and Half Marathon Races (21 km) will go towards Emfasis’ projects aiming to meet the needs of all those who live on the streets or of families below the poverty line. The Mobile Support Unit for the Homeless relief, consisting of a van of supplies manned by volunteers, operating late night till early morning hours. We would like to thank all of you who ran with Emfasis on the homeless of Athens. Furthermore, we would like to express our warmest gratitude to the team of 35 volunteers of GloVo who stood by us the day of Athens Half Marathon. Their previous experience in major sporting events as well as their help and co-operation were invaluable. Thank you very much GloVo! Emfasis invites you again to participate in the Authentic Marathon of Athens in 8 November 2015. The organisers announced that registrations for the 5 km and 10 km Road race have already closed. We still have some spots available. Register now with Emfasis and run for all those in need. For more information contact us at: admin@emfasisfoundation.org or call us: 2114066140 & 6992764001.